Depleted Uranium (DU) is a low cost material that is readily available. DU's high density (19.05 g/cm3, 1.7´ more than 11.35 g/cm3 for lead) and its high atomic number Z = 92 provide useful solution for g-radiation shielding. DU's high density and low cost makes it a material of choice for aircraft counterweights. DU is also a highly effective material for military armor and anti-armor munitions. Control surfaces on wide body aircraft require heavy counterweights, yet have insufficient surface clearance for lighter materials. Tungsten (with density 19.3 g/cm3) or DU are ideal materials for this application where volume constraints prohibit the use of less dense metals. An airplane such as Boeing 747 needs 1,500 kg of counterweights . DU counterweights for Boeing are made by the Starmet Corp. (formerly Nuclear Metals), a Massachusetts based company, in their Federal Aviation Administration (FAA) approved facility. A new radiation shielding material called DUCRETETM has been developed and patented by Idaho Technologies Co. at the Idaho National Engineering Laboratory (INEL). The material will use the large stockpile of depleted uranium to produce spent fuel casks, and contain the spent fuel from nuclear reactors in a more efficient and environmentally sound manner. Using DUCRETETM shielding, containment of dangerous levels of g-radiation from spent fuel can be achieved with thinner shield walls and lower-weight casks. The technology has been licensed to the Starmet Corp. In the early 1970's, the US Army began researching the use of depleted uranium metal in kinetic energy penetrators and tank armor. High density materials such as tungsten (with density 19.3 g/cm3) and DU (with density 19.05 g/cm3) were considered, however, DU was ultimately selected due to its availability and pyrophoricity , , . While 50% of tungsten has to be imported, mainly from China, DU is provided for free to arms manufacturers . Tungsten also has much higher melting point (3410ºC) than uranium (1132ºC) and lacks pyrophoricity. Consequently, a tungsten projectile becomes blunt on impact and is less effective in piercing armor , . DU is hardened by reduction of the carbon content and by alloying with 0.75% by weight (3.7% by stoichiometry) of titanium , . The aluminum sabot of a DU tank round drops off within the first 100 m of the trajectory (see Fig. 4) and the bare DU projectile then moves with velocity 1.5 km/sec. Surface of a DU penetrator ignites on impact (especially with steel), partially liquefies due to the high temperature generated by the impact and relatively low melting point of uranium (1132ºC), and the projectile sharpens as it melts and pierces the heavy armor . Depleted uranium impacts are often characterized by a small, round entry hole. If the penetrator goes through the target, the exit hole is also round and slightly larger than the entry hole . For example, 30 mm DU rounds from GAU-8A automatic cannon mounted on A-10 Warthog aircraft can pierce steel armor up to 9 cm (3.5 in.) thick. Selected DU penetrators in the US arsenal are listed in Table 5 taken from ,  and updated. While the US Navy claims that they have replaced the MK149-2 Phalanx round with a DU penetrator by the MK149-4 Phalanx round with a tungsten penetrator (with the DU round remaining in the inventory) , new types of DU ammunition are being developed for other weapons systems, such as the M919 rounds for Bradley fighting vehicles. Depleted uranium is also placed into the tips of the BGM-109 Tomahawk land-attack cruise missiles (TLAM) during test flights to provide weight and stability . The TLAM missile has a range of 680 nautical miles (1,260 km) and is able to carry a conventional warhead of 1000 lb. (454 kg). Older warheads were steel encased. In order to increase the missile range to 1,000 nautical miles (1,850 km), the latest Tomahawk cruise missiles carry a lighter 700 lb. (318 kg) warhead WDU-36 developed in 1993, which is encased in titanium with a depleted uranium tip , , , . 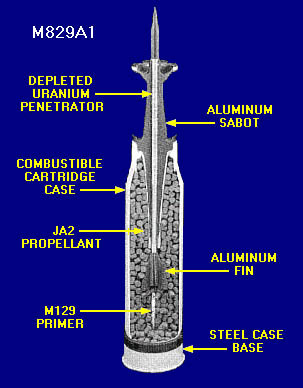 Depleted uranium is also used to reinforce the armor protection of M1 series tanks. US Army publicly revealed the use of DU armor in March 1987. As of 1993, the US Army acquired about 1,500 Abrams M1A1 tanks fitted with DU armor, with plans for 3,000 more . When used in armor, DU is inserted into a "sleeve" in the regular steel armor of a tank, then welded shut. Tank turrets containing Abrams Heavy Armor (AHA) are marked by a "U" (for uranium) near the right side grenade launcher as part of the turret serial number . 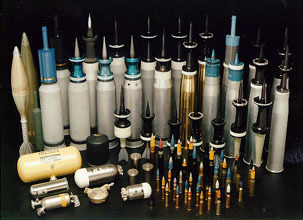 The United States is no longer the only country with DU munitions. Depleted uranium weapons have been acquired by 17 countries including Britain, France, Russia, Greece, Turkey, Israel, Saudi Arabia, Bahrain, Egypt, Kuwait, Pakistan, Thailand, South Korea, Taiwan, and other countries which the Pentagon will not disclose for national security reasons. Nuclear Regulatory Commission (NRC) export licenses reveal the United States to be a major supplier of DU for military systems , , . 127 mm section of buttress grooves with 29.4 mm maximum diameter .